Retold fairy tales are a favorite fantasy sub-genre of mine. Whether we’re talking about something classic like Edith Pattou’s East or a graphic novel fairy tale mash-up like Bill Willingham’s Fables, I am all-in and interested. These stories not only re-mix something familiar, they show us important truths – that there is a heart inside the beast, or that the loveliest wrappings sometimes hide wicked hearts. 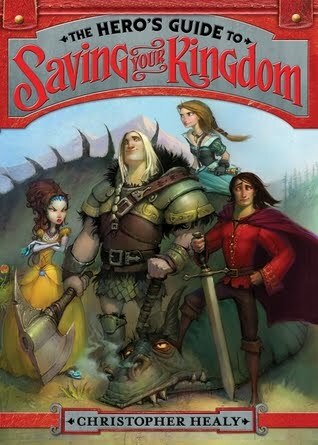 When I first heard about Christopher Healy’s The Hero’s Guide to Saving Your Kingdom, I thought that turning the ‘Prince Charming’ tale on its head might just be the retelling of the year. And while it’s still too soon to tell, the book did make me crow with laughter at multiple points. I’ll be looking for more middle grade fantasy from Healy, that’s for sure! The Hero’s Guide introduces the reader one by one to various Princes who have been heroic enough (at least according to the bards) to attain the title of ‘Prince Charming.’ Each of these fellows (Frederic, Gustav, Liam & Duncan) has his own version of his story, and it doesn’t match the official tale. They also have their particular faults and strengths. What follows is a story of teaming up and running into trouble (over and over and OVER again!). Healy combines the traditional stories of Sleeping Beauty, Snow White, Rapunzel and Cinderella into the overall narrative, and from there things go haywire, sideways, and explosions feature prominently. It’s fun, silly, outrageous and a really good time. While I don’t want to spoil any of the storylines or (gasp!) tell you how it ends, I think I can safely say that we’ll be seeing more of this hilarious and rag-tag group of Prince Charmings in the future. In spite of the Princes’ zany antics and frequent clashes with monsters, the main theme of The Hero’s Guide is character growth. Frederic, Gustav, Liam and Duncan all learn various lessons (some less savory than they would have hoped), and come to appreciate each others’ quirks and strengths. And let me not forget the Princesses of all of their tales! The twists put on the personalities of Briar Rose, Cinderella, Rapunzel and Snow White fleshed out the story. I have no doubt those (dis)reputable ladies will feature prominently in future adventures. One of the best bits about the book is the tongue in cheek, smart-alecky dialogue. It will appeal not only to the middle grade target audience, but also to the adults who read it to them. It’s a bit silly for the usual YA audience, however teens with a sense of humor will likely get a kick out of it too. And I'd be remiss if I didn't mention the fantastic artwork throughout the book. Todd Harris' drawings add something special to the reading. My one (only, tiny!) annoyance with the book were the frequent asides to the reader – things like ‘But you’ll have to wait until Chapter 20 to find out more!’ and ‘Spoiler alert!’ These did not alter my final opinion of the book – I thought it was a smashingly good time. Recommended for: fans of fantasy, fairy tales and monsters, devotees of funny middle grade fiction, and anyone who has wondered if there was something ‘more’ to the classic Prince Charming than just the traditional story. Fine print: I received an ARC of The Hero's Guide for review from Walden Pond Press (HarperCollins). I received no compensation for this review. Sounds cute. Thanks for the warning. I think I simply must check this out. I keep going back and forth on whether or not to pick this up to read with my daughter. Now I feel like I definitely should. carol: I hope you do! I think it's a great book for kids AND parents (especially parents who would like to introduce a sense of humor about the whole 'Princess' culture surrounding the traditional fairy tales).